Screening is a quick and easy refinishing option where we simply rough up the top coat of existing finish without cutting into the wood itself to enable a recoat. 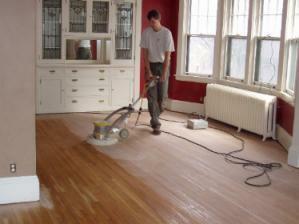 Sanding gets down to the bare wood, while screening simply removes the top coat of finish. We can screen a wood floor by using special metal mesh screening discs attached to a professional high speed rotary floor-buffing machine. You could consider recoating instead of sanding and may be able to make the wooden floor surface look nice again by adding a new coat of polyurethane lacquer or hard wax oil on top of the old finish. 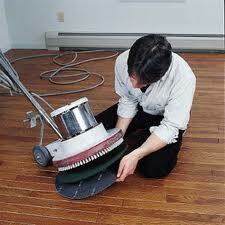 Recoating takes a lot less time to carry out than a full-scale sanding and refinishing project. Floor recoating works on solid wood and parquet floors alike and is especially suitable for refreshing engineered floorboards because this type can only be sanded once or twice depending on the thickness of the surface veneer. Screening will not remove layers of colour on stained wood and is regularly recommended for lacquered finishes because the finish is applied on top of the stain, and the mesh screen will only be lightly scratching the surface. A floor that has previously been waxed or oiled can be restored in this way, but it is important to remember that this type of finish is embedded into the wood grain when applied, and the product you intend to use may not be compatible with the original which is still embedded into the grain. Screening may not be suitable for very badly scratched or damaged floors either because the screen just skims across the surface and does not penetrate the surface of the wood. Problems such as deep gouges or an uneven finish where the current finish isn't the same colour throughout would be exaggerated with screening and this should be pointed out before this type of procedure has started. A simple test can be carried out on a high traffic area where the finish is most likely to be worn to determine if a screen and polish is possible. First, we pour a tablespoon of water onto the floor, if the water beads up and can be wiped off without a trace it means that the finish is still working and it is not necessary to do anything just yet. If the water slowly soaks into the wood creating a moderately darkish spot, it indicates a partially worn floor and in this case, a routine screen and recoat may be the best course of action. However, if the water immediately disappears into the wood completely and leaves an obvious dark patch, then it will need to be sanded down to the bare wood before finishing. Floorfixer may be able to offer this less expensive alternative and the fact that it takes less time to Screen and Polish, this service is especially suited to commercial flooring where business closure can be inconvenient to say the least. Finishing each job by using a product more suitable for use on High Traffic areas where heavy usage is expected, can last far longer between coats and is therefore more cost efficient in the long run. We also offer a FREE ANNUAL INSPECTION VISIT for all commecial jobs, see details by clicking on this LINK.